I have very little patience when it comes to shopping for clothes. If a store is too unmanageable, or too cluttered; or if a shop assistant insists on following me around (or alternatively acts like I’m invisible when I approach with a question); or if there are simply too many people crammed together in too little space, I give up almost immediately and leave: mission shopping unaccomplished. The five reasons mentioned above are exactly why I love shopping at Rude. That and the cool vintage-inspired clothes they sell, obviously. You can get a ’50s style party or cocktail dress, patent leather shoes or a pair of classic Dr. Martens, pencil skirts and my two favourite basic items: cashmere blend turtlenecks in (almost) every colour of the rainbow and Dr. Denim jeans, of which I am a huge fan because of their perfect fit. Prices are definitely affordable, and as the cherry on top the store definitely does not take its name from the girls working there, because they are the nicest. Extremely helpful without being pushy and they have a keen eye for assessing exactly what size fits you. A little tip: if you are more into actual vintage, go a little further down the street to no. 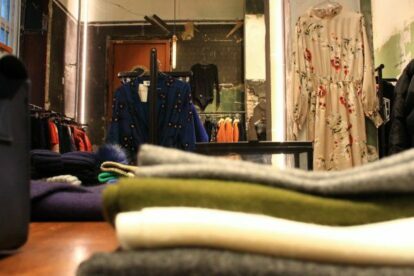 31 where Rude has opened the second-hand store “Vintage”.